We came across the discus fish for the first time in 80’s and we were charmed, by the way it looked and its lifestyle and the charm still lasts and became passion. We would like to acquaint you with discus fish on the basis of our own experience, as well as worldwide literature on the subject. Doing that we shall start with taxonomy and we want to present discuses in their natural environment, because we believe that although the look has been changing, as far as the colour is concerned, genetically it’s still the same fish. Genus – Syphysodon (Symphysis – joining; odus-tooth) it refers to lips of fry that look like beak therefore it allows to collect mucus from their parents’ skin Syphysodon is the only representative of this particular genus (identical genus one claims when crossed (mixed)individuals can bring unlimited fertile offspring – and that’s the case) and it consists of species in plenty different colours and shades. 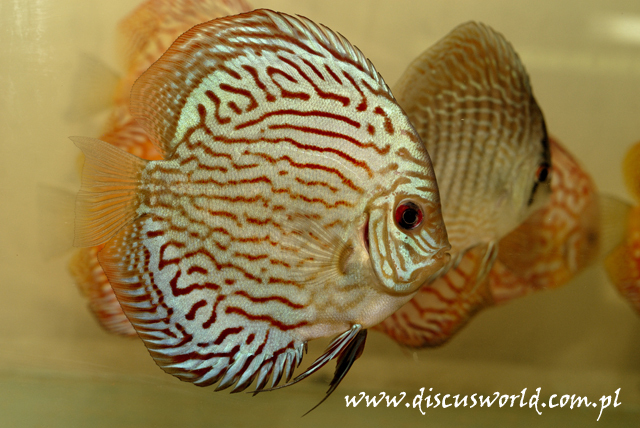 Discus owes its international, common name to German scholars. In Poland it is called discus, “paddle”, disc and perhaps some other different names but we have to remember that it’s still one and the same fish which has its origins in the Amazon river. The homeland of discus is the Amazon river and its tributaries. Discus’ life area comprises smaller rivers, river arms, water accumulations and small lakes where they live in shoals between tree roots. Such waters are mix of so called black and white waters. It is difficult to say what they consist of when you take into consideration that there are only two seasons: wet – when the river level can increase even up to 15 meters above average; and dry season – when level of waters severely decreases. The water temperature oscillates between 25 - 30 Celsius. In such environment discus fish feed on one day larvae (Campsurus) blowing them from the bottom with water streams. This so called blowing through the bottom you can also notice in your aquarium. The menu of discus also contains freshwater prawns with soft shell (Macrobrachium). Even in its natural environment discus fish shows colour variety. It often happens that among caught fish e.g. brown kind there were fish almost red. This natural ability was used by breeders to create a rich variety colour knds. The knowledge about the natural environment that discus fish live in we owe to scholars like Heckel, Szultz or Geisler. However, Kitti Phana-Itthi was first to bred and presented in Aquarama (Singapore) a differently coloured fish named Pigeon Blood. That event initiated work of many Asian breeders on new colour and shade varieties. In Singapore discus’ genetic map was elaborated. Those works resulted in following colour kinds: Pigeon group Marlboro, Red Melon, Fuji Red, Gold itd. Turquoise group Leopard, Leopard Snakeskin, Blue Diamond, Cobalt itd.Brown groupRed Cover, Red Diamond itd. It must be mentioned that there has been confusing mess and the reason is that separate fish farms name the same discus fish in a different way especially for commercial purposes. In many South-East Asian countries fish breeding is a branch of the national economy. Because of that fish farms are very professional, hiring ichthyologists, having hundreds of thousands litres of water at their disposal and using thousands of spawning grounds. 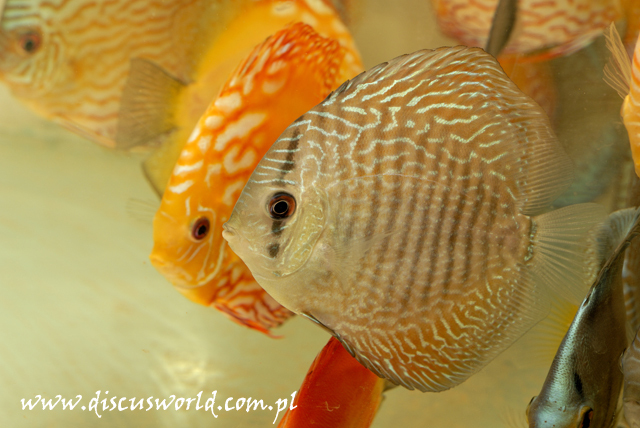 Hot climate is the cause that tap water is even 27 Celsius and that makes perfect conditions to breed discus. It often happens that fry grows in underroof ponds with the bottom covered with foil. Symphysodon is one and only representative of the species (a lot of crossed offspring is the proof) and plenty of common names is a totally different thing. Disc, discus, paddle they are all one fish. Lability of parameter of water that discus lives in while in their natural environment allows to breed the fish in dissimilar waters contrary to the opinion that discus needs defined parameters of water. Correction of PH, enriching water with tannins, osmosis can do more harm than good. Water which has low carbonate hardness contains less buffering capacity and it becomes acid easily. If water is too acid the fish is sick but it is easily to confuse the disease with unicellular microorganisms invasion. Misdiagnosed fish undergo chemotherapy that usually leads to patient’s death. Plenty of our customers confirm that one doesn’t need a lab to keep discus fish perfectly sound. Too high temperature accelerates the metabolism in cold-blooded animals, discus fish among them, and that shortens their life. 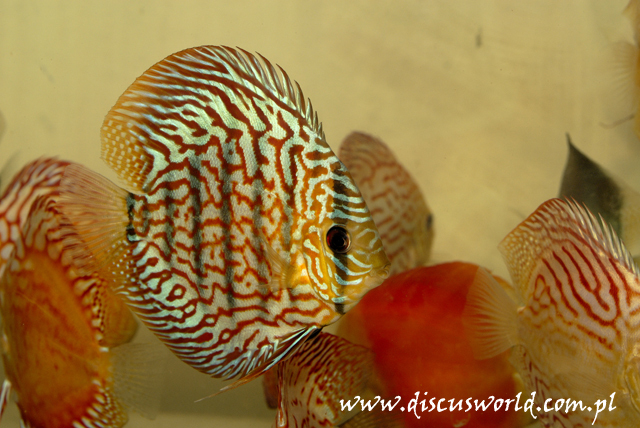 Discus fish don’t like too glaring light they are pretty skittish by nature and eager look for hide. You can see them rarely if there are too many in your aquarium. Casual behaviour in front of aquarium makes them accustomed to the new environment and eat out of your hand. Food seems to be another problem. There are many theories – beef or turkey heart? Maybe noodles? They were good solutions when there were no substitutes. However using mentioned food may cause more harm than good. Such food inadequately prepared makes water more acid, has too little roughage and apparently that doesn’t seem to be a diet good enough for your favourites. Why don’t you trust professionals from laboratories. They work to make your fish fit, strong and colourful. Thanks to Asian breeders we have plenty of multicolour specimens. They take care about their good market reputation and they select fish very carefully. It is obvious that in the nature the survival of the fittest still takes place. However, from a fish farm poor fish go to the market very cheap. Such fish usually underwent chemotherapy are emasculate, weak and they get to Polish market where they are still subjected to treatment. That results in damaged skin and liver which leads to death. Asian breeders are professional who have perfect climate at their disposal (no need to heat water nor room) they are experienced people who organise meetings to exchange their knowledge and share experience. They also must have a certificatewhich allows them to export fish. They sell cautiously selected fish in perfect shape but such animals are a bit more expensive. The aquarium should have the capacity of 150 liters or more – the bigger the better. It should be decorative – someroots and water plants. The tank shouldn’t have too glaring light. Discus fish are gregarious animal. Water hardness - soft to hard. The water should be exchanged and the bottom elutriated on a regular basis. Mechanical filters should be cleaned pretty often. Speaking from experience discus fish grows faster in harder water. We should use the water we have at our disposal and it is not advised to do any correction. That is a job for a chemist. Water should have stable parameters and shouldn’t fluctuate – such water is tap water. Temperature should be between 26-30 Celcius – 28 would be perfect. While exchange don’t add cold water. It is good to use any granular or flake food for discus fish of well recognized companies. Apart from that you can feed fish with oligochaeta (Haplotaxida) and Artemia salina (after defrosting). 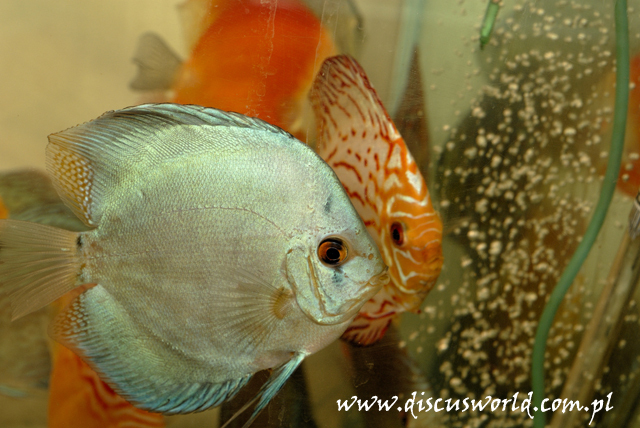 Discus fish get diseases as well as other fish. The most often reasons are: Inapropriate feeding (too little essential nutrients or lice food). Water experiments (trying to recreate the Amazon River water – too many tannins and acids). Poor hygienic conditions (too little and to rare water exchange, food leftovers, dirty filter). Wrong diagnosis of a disease - too much chemistry that lead to skin, gills and internals organs damages. Introducing new residents and plants that are disease hosts without quarantine. Being aware of the reasons of the diseases you can easily prevent unwanted results. Fish from good trusted source don’t get sick too much while being taken care properly. Prevention is better than cure. It would be best to buy fish from trusted already known sources. While buying it’s good to pay attention to the structure of fish (if it isn’t too skinny) colour (the darker it is the more possible of a disease). Healthy and in good shape fish after domestication easily adapt to a new environment. It is really worth its money to pay more and enjoy your beautiful fish than save, a penny and fail. Buying from us can guarantee 100% satisfaction.